Eric MacMillan - click on "What's the Harm?" These links and comments illustrate the harm done by occult, paranormal, pseudoscientific, and supernatural beliefs. The harm may be tangible and easily documented: physical, financial, or interpersonal. December 18, 2007. A Catholic priest, Fr. Andrzej Trojanowski, an academic chaplain in the Baltic city of Szczeczin, Poland, plans to open up an exorcism center on the Polish border with Germany. This is said to be a first for Poland. Trojanowski claims to see about 20 people a week who believe they are possessed by the Devil. The Catholic Church authorized the project in recent weeks, according to Dziennik newspaper reports. Poles from Germany have come to Trojanowski because Germany has no exorcists. Apparently, the last exorcist left Germany about 30 years ago. Not to worry, Poland has picked up the slack. Gazeta Wybrocza said that there are currently 50 exorcists working in Poland. The priest will be assisted by a psychiatrist in his new center, which will be built by the edge of a forest and have a chapel and guest rooms. update: January 23, 2008. Catholic Church officials in Poland have given their blessing to the new exorcism center/spiritual retreat. Father Marian Piatkowski, the regional coordinator of Polish exorcists in Stettin, says that Poland needs more exorcists. Whether Germany will restore exorcism remains to be seen. The practice has been taboo there since 1976, when Anneliese Michel died in Bavaria as a consequence of several exorcisms that had been approved by the then Bishop of Würzburg, Josef Stangl. The two priests who performed the exorcism, as well as Michel's parents were convicted of negligent homicide. The Catholic Church eventually admitted that Michel had been mentally ill. Even so, numerous people in Germany continue to seek exorcists. Richard Bell, an "exorcism expert" from Nottingham University in England, thinks the devil is real and can manifest himself as illness. He also claims that it's impossible for a Christian to be possessed. Christians can suffer from "demonic oppression," though, and require deliverance, i.e., "the driving away of an evil spirit." How he came to this belief is anybody's guess. Bell also claims that the devil and evil spirits are mythological entities but are nevertheless 'real'. If casting out devils was good enough for Jesus, then it should be good enough for us, he thinks. It's war out there, good versus evil, and the devil must be defeated, one soul at a time. Then again, maybe we know a few things about human illness that Jesus didn't. In 1999, the Vatican updated the Rite of Exorcism for the first time since 1614. See also: Ritual of Dealing With Demons Undergoes a Revival by Craig Whitlock Washington Post Foreign Service, February 11, 2008. Bell's argument may be found in Deliver Us from Evil: Interpreting the Redemption from the Power of Satan in New Testament Theology (2007). December 18, 2007. Those who think that psychics who take advantage of grieving parents are vile and depraved may find the exploits of U.K. psychic Charlie Sibley so stunning as to make the likes of Sylvia Browne, John Edward, and James Van Praagh look positively virtuous. "In what must go down as one of the sickest stunts we have ever witnessed," writes Jon Donni of the U.K. forum BadPsychics, "Sibley has used the images of murdered children to advertise both himself and a petition [he calls Support Honest Mediums]." You can view the video, which Sibley has wisely removed from YouTube, and the comments of forum members at the BadPsychics website. In Sibley's defense, he's not completely vile. He definitely has a sense of humor, as can be seen in this video where he claims to channel John Lennon. Sibley may be foolish to think that people would believe that John Lennon's spirit or the spirits of murdered children would communicate through him, but the person he's harming the most is himself. I know. As idiotic as Sibley appears to most of us, there will be some who want so badly to believe in the afterlife that they will come to his defense. After all, we can't prove he's a fraud. Isn't that the beauty and the beast of this scam? Even if Sylvia Browne herself were to be caught on tape saying she didn't care if people were foolish enough to believe what she says, that wouldn't count as proof she's a fraud. December 7, 2007. Many religions throughout history have threatened or destroyed the social order but few have matched the radical Islamists of the present time for either the geographical extent of their operations or the magnitude of their potential for destruction. Islamic fanatics and terrorists seem to be everywhere and probably will one day employ some sort of nuclear device to assert their righteousness. However, there is no official Islamic organization or leader comparable, say, to Roman Catholicism and its pope, which makes it impossible to identify in clear, undeniable terms who is responsible for the terrorist acts committed in the name of Islam. No such problem exists with the Church of Scientology, however, and German federal and state interior ministers have called for a possible ban on the Church, declaring that it violates the German constitution. According to Ehrhart Körting, Berlin's interior minister, Germany's federal Interior Minister Wolfgang Schäuble and 16 state interior chiefs proclaimed "that we do not consider Scientology an organization that is compatible with the constitution." The ministers consider Scientology to be "a threat to peaceful democratic order." Several years ago, Germany stopped recognizing Scientology as a religion, calling it a money-making cult masquerading as a church. What's so bad about that? 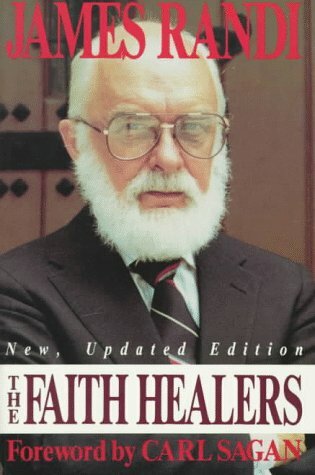 We have dozens of these money-making cults masquerading as healers, faith healers, and psychics. Yet our democratic order seems to require no policing of their activities. Look at Mary Lynch, Kevin Trudeau, Peter Popoff, John Edward, Sylvia Browne, and thousands of others like them. The U.S. constitution seems to protect these kinds of money-making masquerades. After all, the healers and mediums are just exercising their right of free speech or freedom of religion, and the citizens who buy their services and products are not coerced into giving away their money. Apparently, our law enforcement agencies believe that there is no fraud going on here and that encouraging irrationality and superstition is not harmful to the social order. Anyway, the Church of Scientology may still legally operate as an organization in Germany. About a year ago it opened a six-story building in the heart of west Berlin to headquarter its operation. The German government, not to be outdone by these threats to the social order, have set up an office in Berlin to handle complaints about Scientology. Körting has urged Germany's domestic intelligence agencies to continue gathering information on Scientology's activities in Germany. What next? Will the Scientologists have to paint S's on their buildings and wear a circular patch on their sleeves with a slash through the word 'psychiatry'? Will they be herded off to 'relocation centers' for 'intensive interrogation'? According to Deutsche Welle, there are about 6,000 members of the Church of Scientology in Germany. According to the C.I.A., there are more than 82 million Germans. Like the C.I.A., the German interior ministry has good intelligence on the enemies of peaceful democratic order. It's all on tape but the tapes were burned to protect the ministry's snitches who have infiltrated the highest levels of Church leadership. All will be forgiven, however, if Tom Cruise and John Travolta promise never to make another movie. Scientology was created by L. Ron Hubbard, a minor science fiction writer. Was the German interior ministry created by somebody who crossed the picket line of the striking Writer's Guild of America? If ever there were a surefire way to make a religion grow, persecution of its followers is it. It is difficult to assess the harm done to society and the world at large by the spread and encouragement of anti-scientific, irrational, and magical thinking. It is also difficult to measure the extent of harm done to individuals and their families who give up thinking for themselves to follow some guru astrologer, psychic, or cult leader. It is impossible to calculate the losses to those bilked because they are ignorant of basic logical and psychological principles. For those cancer patients who are thinking of trying an untested alternative therapy, please read Dr. Stephen Barrett's A Special Message for Cancer Patients Seeking "Alternative" Treatments.